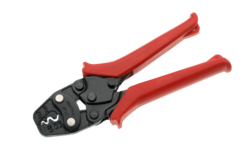 Our product range includes a wide range of crimping tool. The word crimping in this context means to join two pieces of metal together by deforming one or both of them to hold the other. The deformity is called the crimp. 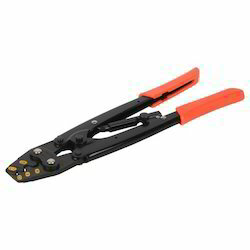 Crimp tools are designed for the connection of electrical and metal components by cutting, stripping, bending, and deforming. Coaxial cable installations require extensive use of crimping, as well as automotive and electrical industries. We have earned a reputation of dignified manufacturer, exporter and supplier of high quality Hand Crimping Tools. 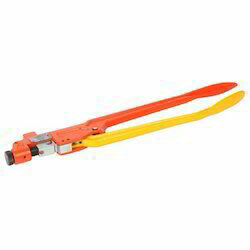 Highly demanded in electrical industry, these tools are used for cutting cables and wires. Offered tools are manufactured in compliance with the defined industry standards using the finest quality raw materials and sophisticated techniques at our sound production unit.Brand Name Multitec Handle Type Metal Handle Item Weight600 g Packaging Dimension (LxBxH)58.4 x 12.5 x 4.6 cmTSINT002025155Capacity10 to 120 mm²Key Features A tool manufactured from ductile iron with special tool steel jaws and a drop forged chrome-molybenum pivoted handle. The tool can crimp cable lugs from 10mm to 120mm with non ratchet screw adjustment, suitable to crimp aluminium copper tube terminals. Soft grip for easy handling. Ergonomic handle design greatly reduces pain. Application The word crimping in this context means to join two pieces of metal together by deforming one or both of them to hold the other. The deformity is called the crimp. Coaxial cable installations require extensive use of crimping, as well as automotive and electrical industries.Brand Name Multitec Handle Type Rubberised Sleeves Item Weight350 g Packaging Dimension (LxBxH)25.5 x 10 x 3.8 cmTSINT002025151Capacity0.5 to 6.0 mm²Key Features Ratchet type non insulated terminal crimping tool. Looking for Crimping Tools ?